was the FIRST studio album by 1476, a band founded by Rob Kavjiann, and formed by Neil DeRosa and Argyle Goolsby in the summer of 2007. Goolsby and Rob met in the summer of 2006 when his band at the time, Blitzkid played with Rob’s current band at that time. When Rob’s band broke up later that year, Goolsby suggested that the two of them write an album of music together. In early 2008, Robb sent Goolsby a demo of all of the songs that ended up appearing on A Wolf’s Age (minus “Closed Casket Heart” which was a song that Goolsby had written, and the band later added). The songs “Herne’s Oak” “Der Vampyr” and “The Cleansing Scourge” were sent titled as “For Goolsby 1, 2 and 3” with no vocals, (complete) melody, or titles. After working on titles and vocal melodies Goolsby sent them back minus complete lyrics. 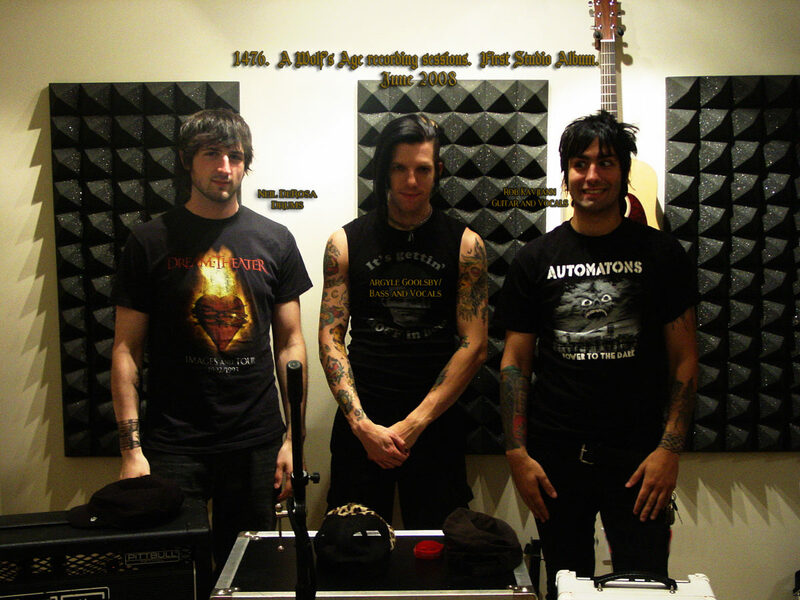 All three members agreed to book studio time with Sean Glonek (Blitzkid, Cryptkeeper Five, Frank Black) at SRG studios in New Jersey to record the album which all three members equally funded. Tracking of the album began in June of 2008. While in the studio, unfinished lyric sections for the three previously mentioned songs were completed by Rob. Goolsby suggested the album be titled “A Wolf’s Age” as it dealt with themes of betrayal, and drew a keen parallel to the chained Fenrir of Norse legend. A Wolf’s Age was released independently through the band in 2009 to one run of 1000 hand numbered digipack cds. A poster was included with a large number of these. Now out of print, and sleeping a giant’s sleep, A Wolf’s Age still runs amidst the shadows of the glaciers like the monstrous and powerful creation that it is. Ever present and pursuant, it contiunues to grow stronger, rooted and more folkloric each day. Though bassist for the entirety of A WOLF’S AGE, the following songs showcase the music Goolsby created, helped create and contributed vocals to. Music: Argyle Goolsby Lyrics: Argyle Goolsby Vocals: Argyle Goolsby Produced by: Goolsby, Kavjiann, DeRosa.